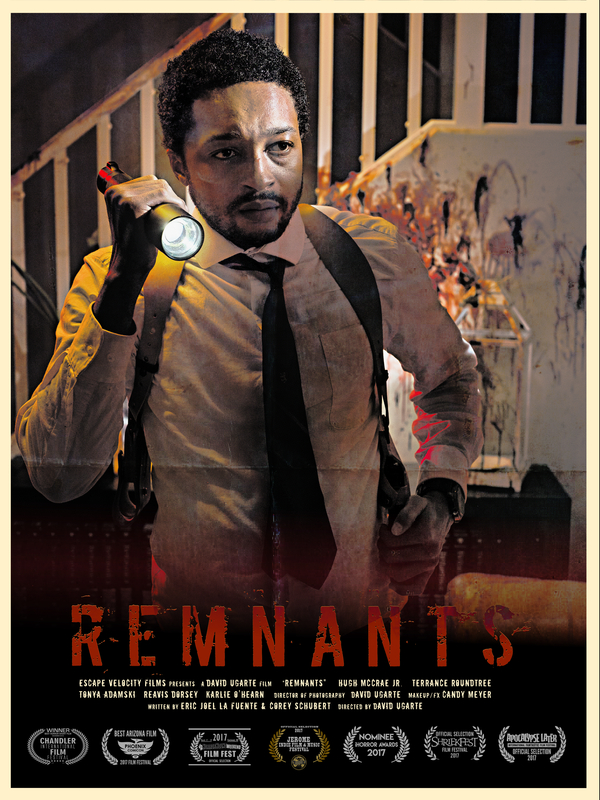 John’s Horror Corner: Remnants (2016), Independent Short Film Review. MY CALL: This brutal police/exorcism film is an excellent teaser for what should probably become its own movie. MORE MOVIES LIKE Remnants: Brutal feature length indies like Last Shift (2015), Baskin (2015) or The Void (2016) come to mind. MORE Indie Reviews: Here at MFF we occasionally do horror short film and pre-release indie film reviews on request. Among recent solicited promotions are Love in the Time of Monsters (2014; feature length), Interior (2014; feature length), Smothered (2014; feature length), In the Dark (2015; feature length), Brother (2016; short), Other Halves (2016; feature length), Scythe (2016; short). The Belko Experiment (2016; feature film, mainstream theatrical release), The Barn (2016; feature length), Shallow Waters (2017; short), Burn (2017; short), Tethered (2017; short), We Love Selfies (2017; short), Cool (2017; short) and Girls Night (2017; short). You can watch this film NOW for FREE on AMAZON, by the way! After attending the 2017 Shriekfest film festival, some social media clamor earned me an invitation to watch and a review a film that gathered quite a bit of attention. 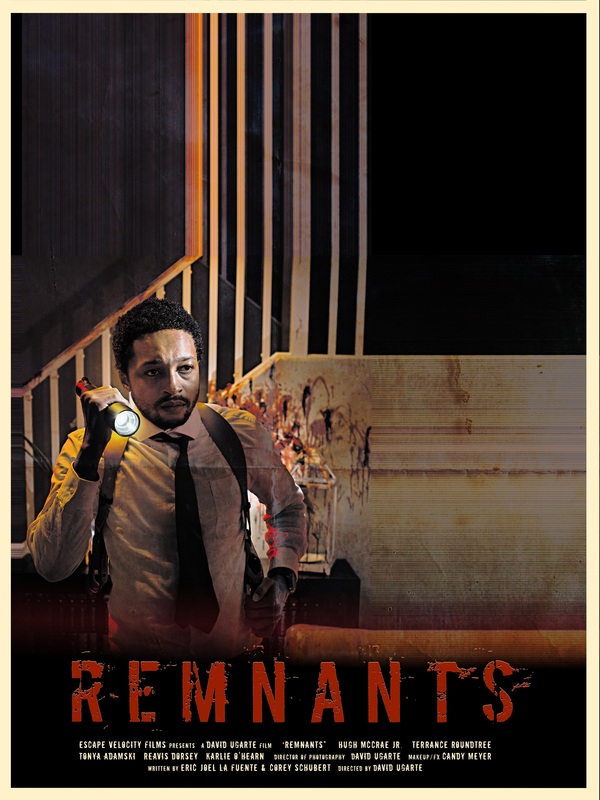 Whereas most short films showcase a basic notion, concept, or even a scene in the mind of the filmmaker, Remnants felt like a proper taster for a potential feature length film. This is especially unusual because of how hard it is to fit character introductions, themes, and a memorable scene or two in a short film—let alone a scene that realizes its way into a subsequent, yet greater, scene. Cultivating urgency is hard, but often opportunistically won by short films with their cold opens. Remnants foregoes this luxury and risks actually introducing us to its protagonists with what little time it has… and it pays off! IMDB summary: “Two homicide detectives and a medical examiner must investigate the worst crime scene in a suburban neighborhood’s history. Among the remains of a butchered family, the detectives find evidence of a crime so horrific that remnants of an unspeakable evil still lurk in the home.” Here’s the IMDB page. A young rookie paired with a seasoned detective, we meet our protagonists driving to a crime scene. The dialogue is a tad formulaic, but delivered with personable candor by actors who make their characters feel familiar (even if somewhat over-explained). I liked these partners…in fact, I’d like to see them for 90 minutes in pursuit of an exorcised evil in suburbia. 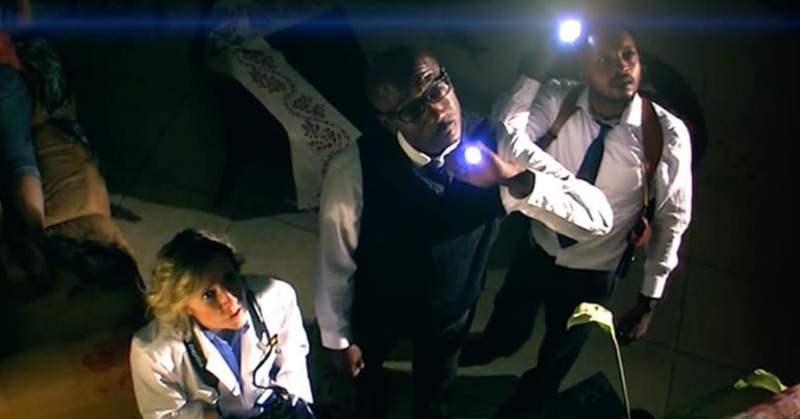 Director David Ugarte (The Crate) and writers Corey Schubert (The Crate) and Eric Joel La Fuente bring weight to the screen as a crime scene investigation reveals one gory chunky prosthetic after another, illustrating a most unusual array of deaths. Dislodged bloody fingernails, macabre imagery, and flaps of latex flesh paint the walls with infernal renovation. I enjoyed first seeing this at Shriekfest and likewise enjoyed my second (and third) viewings with equal enthusiasm. Much as I could watch these characters in a full movie, this short film could just as well be the opening scene setting the stage for a brutal feature length possession and exorcism film. Whatever the case, I look forward to whatever these filmmakers do next. ← John’s Horror Corner: Girls Night (2017), Independent Short Film Review.